Rufus Giwa Polytechnic, Owo (RUGIPO) Resumption Date and Commencement of Academic Activities for First Semester 2018/2019 Academic Session. This is to inform all students of the Rufus Giwa Polytechnic, RUGIPO and the Polytechnic Community that the resumption date and commencement of academic activities for 2018/2019 academic session has been released. RUGIPO Resumption date for first semester for all Fresh Students has been slated for January 21st, 2019. Returning Students are expected to resume on 25th February, 2019. Registration exercise and Hostel Allocation for Freshmen commences immediately upon resumption. 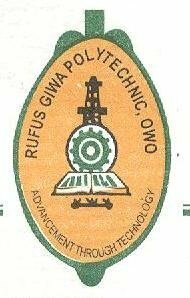 Recommended: Rufus Giwa Polytechnic, Owo (RUGIPO) Academic Calendar 2018/2019.